A peek into my thought process, however far fetched it may seem. - How big of a budget does the music platform have? - Is the marketing site advertising driven? - How much other advertising does the music platform do? (For example if this “music platform” was Spotify I’d consider past television spots, radio, media, and social advertising). This would help us understand how familiar a consumer is to the product. - Is the user hearing about the platform for the first time? - How did the user end up on this page in the first place? Was it a link on social media, targeted email campaign, SEO Google Search result? Knowing this will help me understand the customer's frame of mind. - Does the music platform target other customer segments as well is it positioned as the “one stop solution” for every industry or is it scientific industry related? In real life, these scenarios would be defined by the goals of the product and business teams. Could a music platform help scientists in a lab because it increases productivity? Would a music platform help scientists in a lab by serving as the background noise to their jobs? Can a music platform help scientists in a lab by aiding in scientific research? I chose two different audiences that would benefit and created a quick audience profile for each group. Tech proficiency: Very High. Runs multiple database programs simultaneously. Lab Data Management & Analysis Software, Enterprise-Level Lab Informatics. Assesses the need for Data Analysis and Storage Solutions. They might ask: What is the ROI of investing in the software? They might ask: Will it help secure more grants? Tech proficiency: Medium. Runs accounting software and generates customized reports bi-weekly. Comfortable with the facility's intranet system. In charge of tracking DocuSign contracts with equipment vendors. Manages departments CRM as an admin. Enjoys playing Fortnite in his spare time. Of course in real life, this audience data will not be made up, but I did have fun inventing these profiles on the fly. The more information about the target market that is provided upfront, the easier it will be to come up with messaging and marketing strategy later, which will go hand in hand with coming up with page design and layout. Two audience profiles will be targeted. Need to decide if marketing automation is considered and what platform will drive this. This will make an impact on the design constraints. Provide an easy way to access research and case studies. Once an audience is identified + goals of the audience are understood+ marketing strategy is compelte+ messaging is thought out+ requirements and constraints are put into place for the design. In “real life” most of these things will be provided by different business units, but you might have to jump in and fill in the gaps when needed. - Is this landing page standalone, or a series of landing pages for other products? - Are they selling other software? - Do they want to provide a comprehensive “about” page? - Do they want to launch a software tour? - Will they be providing a “portal” for customers to log into? - If yes — there will need to be a “registration/login” link. - Is there a need for a FAQ section? 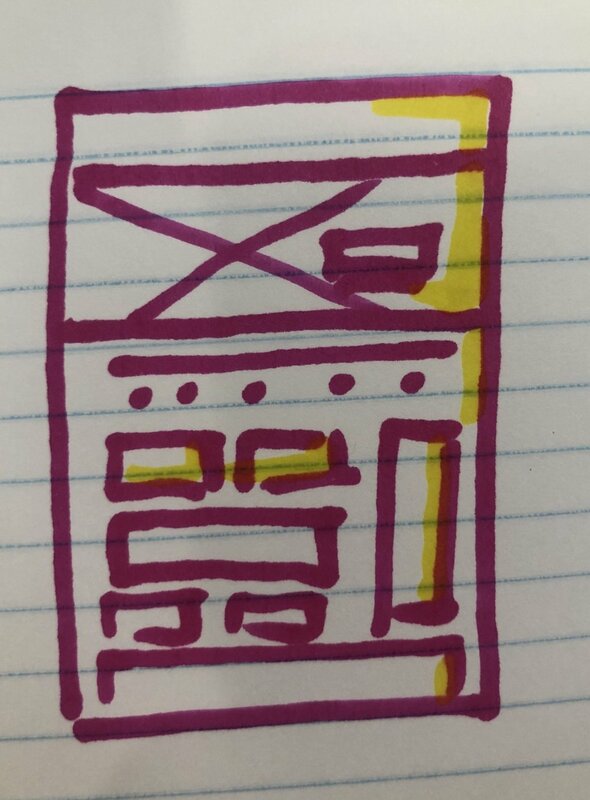 Under navigation: Informative hero image (a large image that has become standard on most marketing sites) with a clear value proposition. This hero image can contain “one message” or contain multiple messages in accordance with the companies goals. One example of this is a “carousel” or “image slider” that could contain multiple CTA’s (Call to action buttons to register, sign up for more information, purchase now). Features overview module: This will highlight the software benefits and usually includes 3–5 top features (these can be personalized depending on whos viewing it as well). - Is there a more elegant solution for lead generation? - Is this a proper use case for a chatbot? - Would a call to action be effective in the header? It goes without saying the visual designs will be polished with a series of reviews, feedback sessions and iterations with brand managers, stakeholders, product owners, strategists, copywriters, and probably an overly opinionated Art Director (who has no context to the actual goals but has a “grand vision”). You made it all the way through and stuck with me, I appreciate that! I may continue this idea as a series of generated design prompts and the thinking behind them. I will update this section accordingly.